CLA (Conjugated Linoleic Acid) is a naturally occurring trans isomer of linoleic acid. It can be found naturally in organic grass fed beef and dairy, and may have a positive effect on weight loss and weight management. You can find Conjugated Linoleic Acid in mostly dairy products but mostly from organic grass fed beef, eggs, and chicken. Supplementing CLA from a high quality organic supplement can help increase your intake of linoleic acid if organic grass fed beef or foods are too expensive. CLA is the #1 most research weight loss supplement in the world, with over 160 clinical studies conducted. Sports athletes take CLA to help them reduce overall body fat, increase energy levels, and improve muscle strength and size. CLA is not just for fitness enthusiasts either. Improve metabolic health to induce natural, healthy weight loss. CLA supplementation is not associated with any observable adverse effects at the doses studied. Most products are dosed small enough to ensure safe and proper supplementation. There are no established safety standards for CLA intake. Currently, Tonalin is the most clinically researched formulation of CLA. Any product that contains Tonalin will far exceed the effectiveness of regular standardized CLA. The majority of products listed contained Tonalin. However, we did observe that all highly respected sports nutritional brands like Optimum and Musclepharm contained lower quality formulations of CLA. Any product that contains Tonalin CLA is considered to be superior. Research shows the CLA supplementation is effective at 3200 mg daily, taken with meals. This dosage assumes that you’re using the highest quality form of CLA. At the present moment, there is little scientific evidence supporting the efficacy of CLA for weight loss/fat burning/fat loss. Benefits of supplementation, were marginal. Studies suggest that CLA may help preserve lean muscle mass during dieting and exercising. This protects individuals who are rapidly losing weight from losing too much muscle mass. These claims have not been replicated enough to be considered reliable. Studies assessing the effects of CLA on fat mass in humans have shown variable results, with the majority of testing failing to produce significant benefits in reducing fat mass in already healthy individuals. At this time evidence is too unreliable to be able to make a guaranteed assumption. In one study, 1.7g of CLA per day (taken 30 – 60 minutes prior to meals) over the course of 12 weeks was shown to reduce body weight and fat mass in the 63 individuals tested. Average weight loss among the 63 subjects was 1.5 lbs over the 12 week period. The study relieved that CLA has far more efficacy in obese persons and greater benefits in females than males. It should be noted that research into the efficacy of CLA in humans for weight loss and weight management is still relatively nascent, with the majority of studies having little to marginal benefits on weight loss. It should be noted that a majority of the studies involved large sample sizes and long treatment duration. In fact, one study was conducted over a 2 year period on 134 subjects and showed positive effects on CLAs ability to reduce fat mass. Overall these studies show that CLA may work for most individuals who can follow proper supplementation protocol over a long period of time. The products were tested for quality and effectiveness based on their formulations, dosages, and ingredient profile. Products that used the highest quality formulation of CLA were ranked higher. The majority of clinical studies conducted used Tonalin CLA. Products that used the less effective variations of CLA are considered to be cheaper and of lower quality. Products that had a proprietary blend were ranked lower. Hidden CLA dosages makes it difficult for users accurately track CLA dosages. Onlinestrength found that a majority of the highest selling CLA products did not use the clinically tested Tonalin version of CLA. Individuals who want to take the highest quality products need to make sure that Tonalin is marked on the bottle. Products that have the cheaper versions of CLA are far less effective and usually of lower quality. 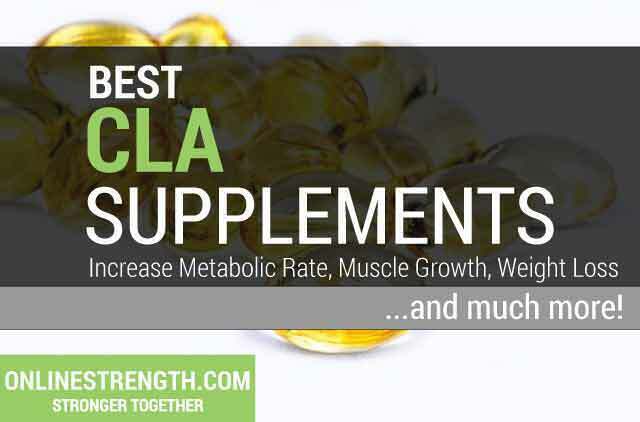 Typically all CLA supplements you will find on the current market are made from 80% safflower oil. Capsules will contain 80% oil and 20% fatty acids such as palmitic, oleic, stearic, and linoleic acids. Tonalin and Clarinol are the two most common CLA brands and are typically deemed higher quality. Its best to find a product containing either of these two branded CLA variations. The typical dosage of CLA ranges from 3,000 mg – 5,000 mg daily, usually in divided dosages taken with meals. Studies that used CLA for lean body mass improvements used a dosage of 3,000 mg – 4,000 mg per day. PS: Stick to the higher quality brands. Spending a few extra dollars for a more well known brand will ensure freshness and overall cleanliness of the supplement. Lower quality brands often have more toxicity.